Using assorted percussion instruments, music educator/percussionist Craig Harris provides adults and children with the key to stress relief tools for emotional balance. "Stress is about dreading the past or fearing the future," said Harris, "When one plays a drum or percussion instrument, they're immediately transported into the present." Craig Harris holds a Masters degree in education, and teaching certification in music and early elementary education. 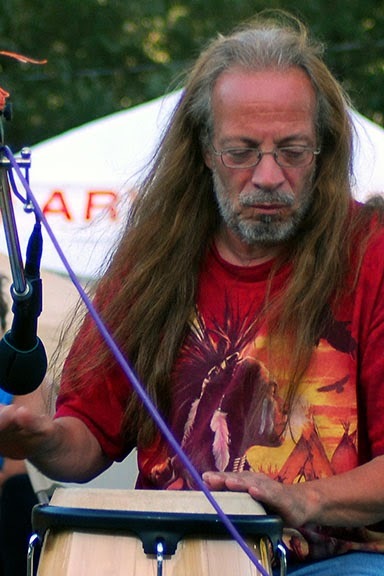 For over 26 years he has shared his passion for music with young and old throughout Greater and Western Massachusetts. The author of The New Folk Music (White Cliffs Media, 1991), The Band: Pioneers of Americana Music (Rowman and Littlefield, 2014) and Heartbeat: The Magnificence of Native American Music (forthcoming), Harris is also a major contributor to Music Hound Folk Music: Essential Album Guide and Music Hound World Music: Essential Album Guide.